The Sarawak team and officials gather for a photograph at the end of the 6th Milo-KPM-WFM Wushu Championship at Han Chiang High School Indoor Stadium in Penang last Sunday. 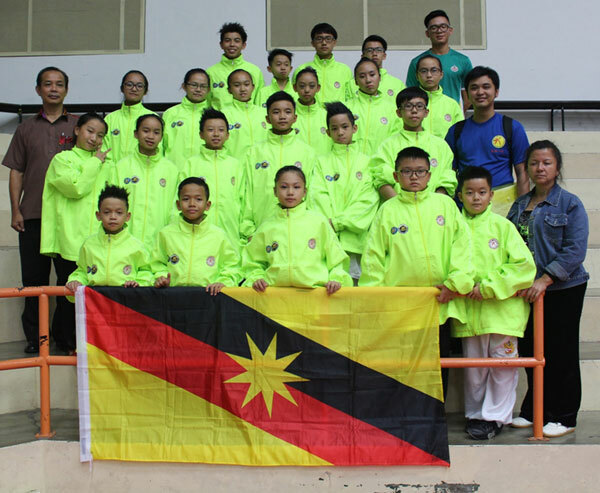 PENANG: Sarawak ended its campaign in the 6th Milo-Kementerian Pelajaran Malaysia-Wushu Federation of Malaysia (KPM-WFM) Wushu Championship on Sunday with three gold, two silver and six bronze medals. This put them in sixth place after Malacca, Penang, Negeri Sembilan, Kuala Lumpur and Johor. Elvic Bong Qian Zheng added a second gold to his collection on the second and final day of the championship at Han Chiang High School Indoor Stadium on Sunday. The Sukma double gold medalist topped the Boys A qiangshu competition after posting a score of 9.44 points to beat Malacca’s Ang Qi Yue (9.08), Chang Men Da (8.91) of Negeri Sembilan and Hon Choon Wei (8.78) of Labuan. Elvic won his first gold on Saturday when he scored the highest points in Boys A jianshu. He also bagged the silver in the Boys A changquan. The day’s second gold was delivered by Mok Xiao Yuan in the Boys B taijijian where he scored 8.35 points to beat seven other competitors. Mandy Lim Xin Hui ended her campaign with another bronze in Girls A nangun to add to the two bronzes she won on Saturday in the Girls A nanquan and nandao. Stephanie Ngu Cai Ern won the bronze in the Girls C qiangshu after scoring 8.55 points. She also collected a bronze in the Girls C changquan. Sarawak’s other bronze medals were contributed by Mok Xiao Yuan in the Boys B taijijian. Team manager Tiong Yong Hee said the state athletes especially the new faces had gained and learnt much from the experience in the two-day competition. “Our focus is on giving them the vital exposure and also identifying those potential athletes for further grooming as backup athletes for the next three Sukma,” he pointed out. “The standard of wushu in this championship is quite high and I believe our athletes can do better next year with consistent training and more hard work,” he added. Meanwhile, Malacca topped the championship with 24 gold, 23 silver and 12 bronze medals. In second place were host Penang with 15 golds, 11 silvers and 16 bronzes, followed by Negeri Sembilan (7-8-23), Kuala Lumpur (6-6-14) and Johor (5-3-10). The seventh to 16th positions were occupied by Labuan (2-3-7), Pahang (1-4-6), Selangor (1-1-3), Perak (0-2-9), Sabah (0-1-2), Putrajaya (0-0-6), Terengganu (0-0-2), Kelantan, Kedah and Perlis who went home empty-handed.